Onyx Solar has collaborated with Butech, Porcelanosa’s subsidiary focused on materials and constructive systems development, in the creation of the first PV pavement which is expected to be in the market by the end of the year. This innovative product was introduced at Porcelanosa’s Annual Show in February and turned out to be one of the main attractions of the show, the largest ever in terms of attendees. Porcelanosa is one of the world’s leading manufacturers of high-end ceramic tiles and kitchen-and-bath products. Onyx Solar is specialized in the integration of solar photovoltaic solutions in buildings. This cutting edge system, which is still in an early development stage by Onyx and Butech engineers, is made by a solar PV glass integrated over elevated ceramic and it´s completely walkable. One of its main atractives is the versatility and the fact that it is posible to place furnishing on it without losing space. The pavement combines pasive elements (avoided CO2 emmissions) with active elements (power generation) reducing remarkably the impact of the building on the environment. But the PV pavement is not the only Project in which Onyx Solar is working alongside Porcelanosa’s subsidiary. They are also working on a PV façade developed by both companies which, unlike the pavement, is already available and being installed in projects all over the World. The Spanish team from the UPM (Universidad Politecnica de Madrid), presented last week the design of the solar-powered house that will take part in Solar Decathlon 2009. The UPM is coordinating the Spanish multi-disciplinary team of young engineers and architects in this fourth edition of the contest. The prototype, named the B&W House, representing the balance between black and white, was presented on January 15, at the Cervantes Institute in New York City by Josep María Adell, Professor of Architecture at the Polytechnical University of Madrid (UPM) and project manager of Team SPAIN in the Solar Decathlon. The B&W House’s design is based both on technical and bioclimatic criteria, using the latest technology. The objective is to minimize the impact on the environment while achieving an atmosphere of optimal living inside. The eventual construction will be a cubic, one-story building measuring 45 square meters (483 square feet) that supports a large solar panel capable of orienting itself to the sun during the day and resting in a horizontal position at night. The house’s interior is a unique transportable module that includes all the technology needed for energy self-sufficiency, since not only is energy captured by the solar panel on the roof but also by vertical panels on the walls that also move in keeping with the Earth’s rotation. The B&W House’s commercial costs will be much lower than those of a traditional house. The design also offers the possibility of separately selling optimized products with independent functions. The Solar Decathlon is a competition organized by the U.S. Department of Energy. Universities all over the world can compete by designing their own solar prototype. A solar city will be constructed at the Washington Mall in October where all the solar houses of the respective universities are displayed. Each home will be judged on 10 criteria including style, innovation, efficiency, lighting design, engineering, market viability, appliances and home entertainment. Once the competition is finished, the Spanish team plans to enlarge the house by adding another story between the ground floor and the self-adjusting roof, whose orientation to the sun is reminiscent of a sunflower. The UPM has taken part in the Solar Decathlon on two previous occasions, finishing in fifth and ninth place in 2007 and 2005, respectively. “On this occasion we have to do better; we’re going to try to win,” Adell said. He added that it would be good for Spain to have a strong performance ahead of the inaugural European version of this same competition in 2010. “The UPM is working at the commission of the (Spanish) Housing Ministry to organize the Solar Decathlon Europe, which will be held in Madrid in 2010 and in which 21 universities from 10 countries are to participate,” the project director of that initiative, Sergio Vega, told Efe. 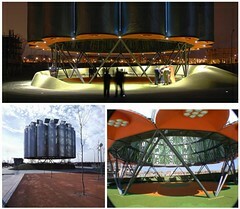 For more information about UPM and Team SPAIN visit http://www.solardecathlon.upm.es/. The Spanish energy company Gas Natural inaugurated yesterday in Seville one of the first European solar cooling experimental plants. The technology behind it is double-effect solar absorption cooling backed up by natural gas. That allows for more efficiency and consistency in obtaining cold levels apt to be used in heating and refrigeration. The project’s main objective is to allow the company acquire enough experience to be able to deploy these solar thermal cooling units in buildings starting next year. This drive has been fueled by the Spanish new Technical Building Code (TBC) which, since September 2006, has made the installation of solar collectors compulsory to contribute to the household hot water requirements of both new and rehabilitated buildings. This 3,767 square foot installation is located on the roof of the College of Engineering, at the University of Seville, that is a partner in the project along with the Andalusia Technology Corporation, a public agency that fosters Research and Development in this Spanish region. The investment in the installation amounts to 1,3 million euros ($2 million). It provides a third of the cooling needs of the building in summer (around 500 kW), and from half to all of its energy needs in winter, depending on the month. The hemp plant (Cannabis sativa L.) gets a bad rap because of its association with drugs, but it was already in use 8.000 years ago and is present today in a wide array of sectors ranging from medicines, body care products, and clothing to the automotive industry. One promising application for this plant is as a building material for Bioclimatic architecture in the form of a brick. The Spanish newspaper El Mundo reports about Cannabric (Spanish only), a company launched nine years ago by the German architect Monika Brümmer in Guadix, province of Granada. Her career project researching vegetable building materials led her to this hemp product, achieved through an arduous trial and error process. Growing hemp improves the condition of the ground. It is a robust and fast-growing plant that requires neither herbicides nor pesticides during its cultivation. Industrial hemp has a very low thermal conductivity, producing a brick with vastly superior insulation properties against both cold and heat. It is a popular material in the cave houses typical of the area around Guadix, in Granada and it is also gaining ground in other regions around Spain, as it is especially suited to areas reaching extremes of temperature in summer and winter. It has even been used in the restoration of a monastery in the province of Palencia. Hemp bricks have also been used in projects in France and England. A new building inaugurated last December at the Almeria Solar Platform is set to achieve energy savings in a range of 80 t0 90%, compared to a conventional building. What´s more, the energy that it does consume comes from renewable sources. It is part of a research project that will run up until 2010: a myriad of sensors will check if actual conditions match the theorical predictions posited in its design and construction. CIEMAT, the Spanish Research Center for Energy and Environmental Technologies, is behind this initiative called PSE-ARFRISOL (initials for Bioclimatic Architecture and Solar Cooling, in Spanish), with an initial budget of almost 59 million dollars. It is joined by the universities of Oviedo and Almeria and different construction (Acciona, Dragados, FCC and OHL) and solar energy companies (Atersa, Gamesa Solar, Isofoton and Unisolar). Its main objective is to develop a total of five architectural prototypes, one for each climate area found in Spain (Cold, Warm, Hot dry and Hot wet). The building just inaugurated corresponds to an area, Almeria, that fits the hot and dry conditions. The Almeria Solar Platform, where it is located, is a center from the CIEMAT network that pioneers different cutting-edge solar technologies and installations. The building comprises active strategies like thermal solar collectors, pv panels, forced ventilation and absorption pumps, as well as passive strategies, such as solar chimneys, natural (simple and crossed) ventilation, buried pipes for cooling, etc. Even though technology helps, so does common sense to take advantage of the climate conditions of the place regarding the orientation of the building, natural lighting and isolation treatments, to give some examples. The Ecoboulevard is an interesting idea by the young architecture firm “Ecosistema Urbano” (also involved in the Philadelphia Urban Voids program). The project got one of the first prizes at this year Architectural Review (AR) Awards for Emerging Architecture. The neighborhood of Vallecas, in Madrid (Spain) was looking for innovative ways to have more social activitity in the streets and more greenery at the same time. The winning project was the Ecoboulevard. The idea is simple (see picture): a round structure in public square that acts like a nursery with “air trees” going up providing shade and cooling the atmosphere. These “mini-forests” are ‘easily dismantled and energetically self-sufficient’, as they are connected to solar panels at the top of the structure to be used in social gatherings and events. When the metallic structures are no longer reliant on air conditioning, they can be disassembled, and left as ‘clearings’ in the urban forest. The AR judges liked the combination of ideas: the tree, the container in which it might sit, solar power and the flow of air through a given structure, with a visually impressive appearance. And now for something completely different. After seeing all the technology displays during the Solar Decathlon, this low impact house in the Welsh countryside is a sort of back-to-basics counterpoint showing another way of thinking outside the box. Roof water collects in pond for garden etc. Simon Dale, the builder (along with his father-in-law) is a graphic arts designer and photographer. His pictures are mainly about landscapes and they are really beautiful, by the way, don´t miss them.